If I could have one wish this week, it would be that you could all meet our chef, Vix. She’s such a generous, warm soul and you can tell from the first time you meet her, that her passion for food is indescribable and genuine. This tabbouleh is an absolute favourite of hers and she’s so proud of the flavours that she wants you all to try it. She believes it will bring some absolute sparkle to your dinner time and to your day. Enjoy! Pre-heat your oven to 200 degrees. Combine the bulgur wheat, boiling water (as stated above) and ¼ tsp of salt per person in a large heat-proof bowl or pot. Cover with a lid and rest (off any heat) for 25 mins, or until the water has completely soaked into the bulgur wheat. Now it’s time for our meatballs! Peel and very finely chop the onion and garlic. 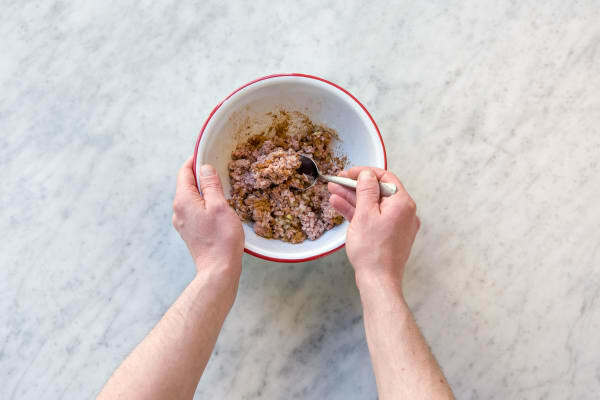 Place in a large mixing bowl, together with the lamb mince, cumin, cinnamon, panko breadcrumbs, flour, a good pinch of salt and a grind of black pepper. Tip: If you have some cayenne or chilli powder in the house, feel free to throw in a dash of this too! 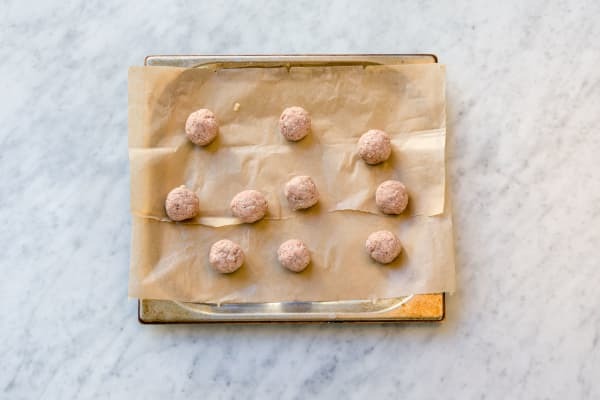 Thoroughly combine to form five meatballs per person and place on a baking tray. Pop the meatballs in your oven for 20 mins, turning halfway. The meatballs are fully cooked when the meat is no longer pink in the middle. 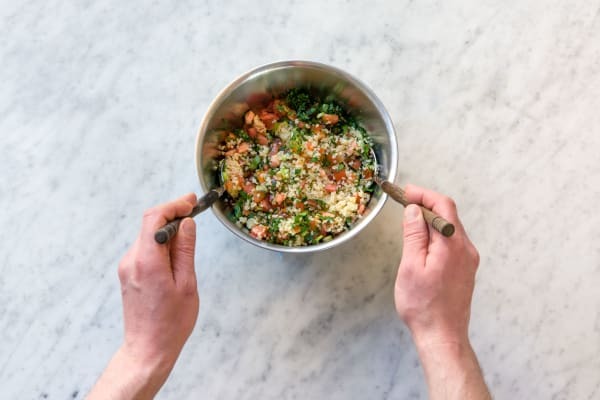 While your meatballs are cooking, you can return to the tabbouleh. The bulgur wheat should be ready now - drain any excess water and place in a large, clean bowl to cool down. Finely chop the tomatoes, spring onions and flat leaf parsley and add them to the bowl. Finally juice the lemon and add this, together with 1½ tbsp of olive oil per person, a pinch of salt and a good grind of black pepper and toss to combine. Taste and add more seasoning if you like. Now, it’s time for the raita! 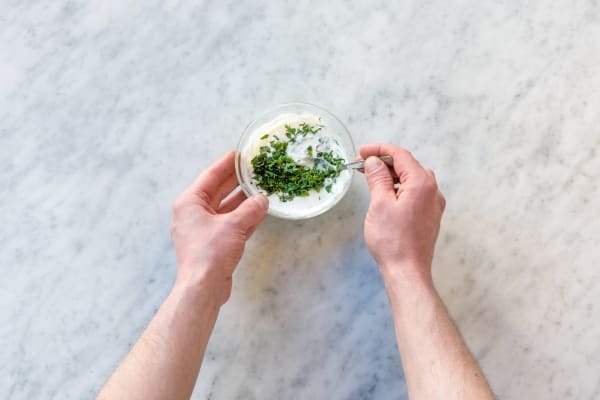 Finely chop the mint and combine with the yoghurt, a pinch of salt and a few good grinds of black pepper. All done! 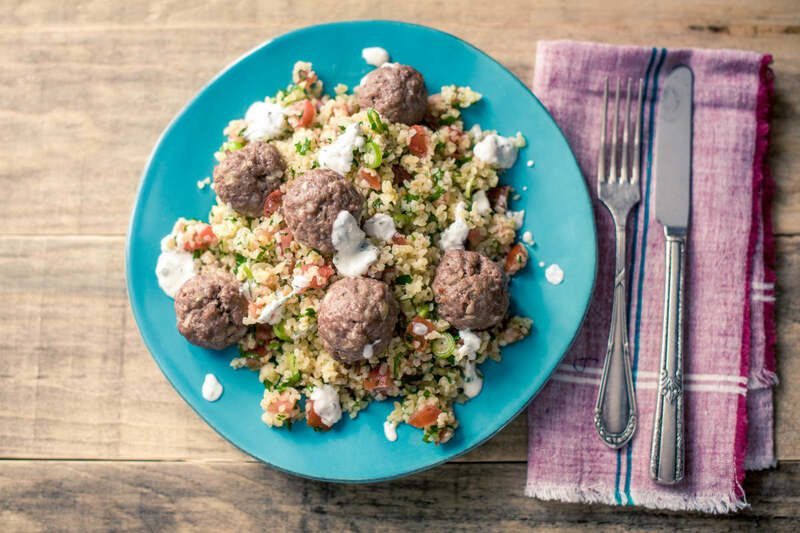 Serve your meatballs on a bed of tabbouleh and top with your raita. Enjoy!